Now that I have finally understood the concept of temperature, which is mostly synonym to miai value, I may want to rewrite this page. The concept of sente and reverse sente make much more sense now. 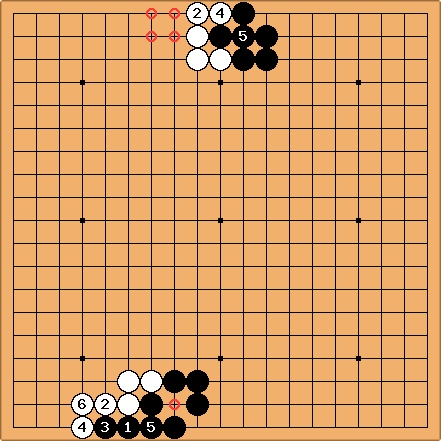 My analysis goes against Ogawa's endgame theory on two accounts. Firstly, I am not satisfied with a superficial understanding of sente. I take the hane-connect as a typical example. Almost everyone sees the hane-connect in the endgame as sente. And indeed, at some point White will needto add a stone, or she loses points. Secondly, the "sente = x2" formula is a convenient rule of thumb, but too rough for determining a good sequence of moves. I have therefore evolved to another rule of thumb: play sente moves first, and then gote moves, and spend time evaluating whether something really is sente. Following diagrams should clarify. 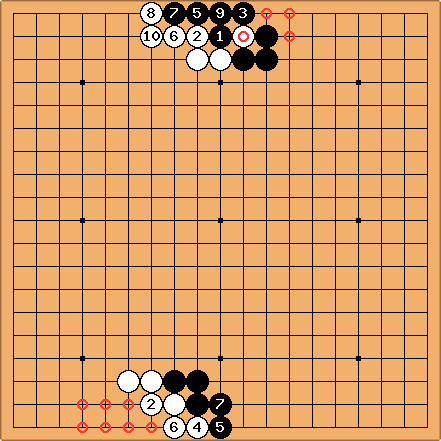 Diagram 1 shows two possible endgame moves. a is a hane-connect and "sente", in the sense that White will have to answer at some point in time. B rescues 4 stones. The marked stones and points indicate that they do not count in the "zero state": they can become neutral or profit points. 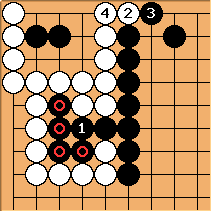 a is "sente" for Black but gote for White, and according Ogawa's calculation is worth 2x3 = 6 points: Black makes 2 points, White would make one with respect to the zero state (the circled points). And Sente is x2. Rescuing the 4 stones with b is 8 points. However, Black a in Diagram 1 is sente: if White does not respond, its largest territory goes to waste. The follow-up is bigger than catching the four stones, namely 10 points. 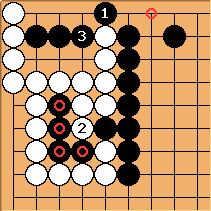 If White local answers, so Black plays in sente, then cover Black then . 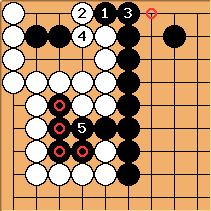 Compared with the neutral situation makes White 0, and Black 1. Z 1. This is best for both. In Diagram 2, the White area is considerably smaller. Now the follow-up of Black a is worth 6 points, not 10 points. This means that it is no longer positive for White to answer : she takes four stones instead. In Diagram 2, Ogawa's way of counting works. The 8 points gote is larger than the response to the 3 points sente, because the follow-up of the sente is less than 8. 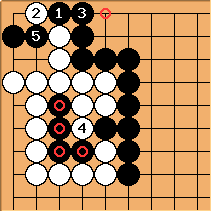 In Diagram 1, Ogawa's way of counting doesn't work because the follow-up of sente is greater than 8. You can now say that it is impossible for endgame analysis to read out all nodes, and that is true, especially with a time limit. But on the other hand we must warn ourselves that what looks like sente is far from always sente. Very few moves are absolutely sente and the moves that are sente, are therefore larger than most other (gote-) moves, regardless of the "sente = x2" formula. In matches with time limitation, we have no time to evaluate everything. A move that threatens to reduce a large area, or undermines a group, we can consider as sente. For other moves we evaluate their size, including the follow-up of tenuki in the calculation. This analysis takes more time than the Ogawa method, but not so much more, and provides a much better understanding and often enough a different order of moves. The main advantage of a critical endgame analysis is the option to apply mutual damage. Once you realize that sente even a matter of agreeing with each other, you will have a much greater capacity to resist, and you change from a slavish into a combative practitioner of the endgame. Reverse sente is another concept from the confusing discourse on the endgame. In essence reverse sente is actually gote. The only difference is that it slows down your opponent in their sequence of moves. We start again in diagram 1. White can choose between the a' reverse sente ' or b'' gote. 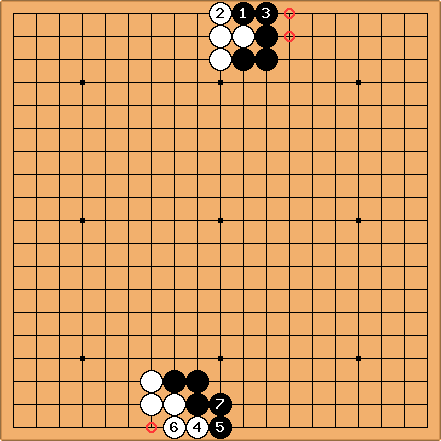 For White, this is a choice between 3 points or 8 points. The choice is easily made. 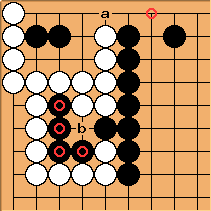 In diagram 2, a no longer is sente for Black, compared to the value of b, as previously demonstrated. But this difference does not matter at all for White. In both cases she chooses the largest gote. This shows that reverse sente and sente are not equivalent. The reverse sente moves are weighed against the other gote moves. The sente moves must be played first, after confirming that pthey really are sente, by weighing their follow-up against the largest gote. Ogawa's book has yielded an excess term (reverse sente), which might have value deep down the probabilistics , but for simplified endgame strategy is virtually worthless. Find out which moves are sente for you. The only concession to this is that very small sente can be held in reserve. 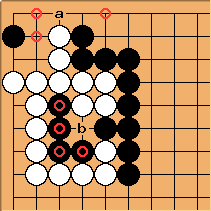 After all, the opponent will not likely to play the move as reverse sente, since for them it is only small gote. As long as there are options for a ko with reasonable value, you can keep such sente as a ko threat. 4 points with local tally 1, or 4 points in sente.